We’d love your help. 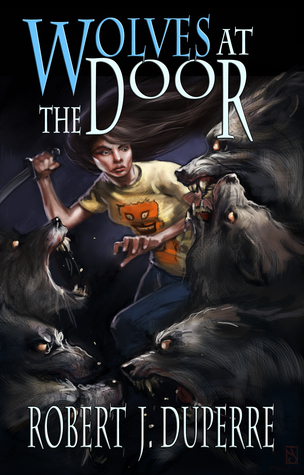 Let us know what’s wrong with this preview of Wolves at the Door by Robert J. Duperre. Now that the cat’s out of the bag, the other secrets regarding Jacqueline Talbot’s past—and future—begin to come clear. It’s a lot for a sixteen-year-old girl to deal with, especially when she’s told that the fate of the world rests on her shoulders. Jacqueline now must prepare herself to take on the rest of the Trials; the only problem is, no one’s really sure what they a Now that the cat’s out of the bag, the other secrets regarding Jacqueline Talbot’s past—and future—begin to come clear. It’s a lot for a sixteen-year-old girl to deal with, especially when she’s told that the fate of the world rests on her shoulders. Jacqueline now must prepare herself to take on the rest of the Trials; the only problem is, no one’s really sure what they are. Not even her aunt, who seems to know a little too much about everything. To ask other readers questions about Wolves at the Door, please sign up. What a stellar follow up. I really enjoyed this. Full review to come very soon! Born on Cape Cod and raised in northern Connecticut, Robert Duperre is a writer whose main ambition is to create works that defy genre. His first novel, "The Fall: The Rift Book I" is now available in paperback and for the Amazon Kindle. Robert lives with his wife, the artist Jessica Torrant, his three wonderful children, and Leonardo, the super one-eyed Labrador.